December 2004, Volume 1 Issue 12 Know It - Profit! "Is Natural Gas On The Rise?" This month, using the Three Step Set-up, we'll uncover a few stocks with good trading potential. Using the relative strength comparison method, I considered a handful of indices... measured against the S&P 500. Here are the ones that rose to the top: defense, commodities, health care and natural gas. 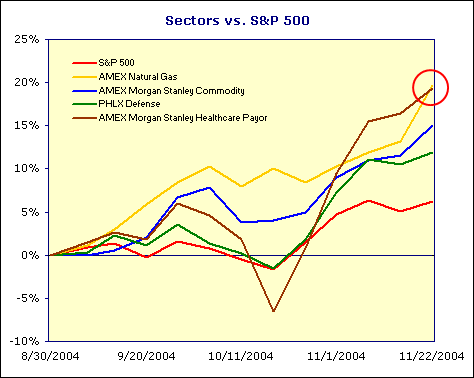 The AMEX Morgan Stanley Healthcare Payor and AMEX Natural Gas indices are the clear front runners. It's a toss-up, but I'll go with the natural gas index since it has already consolidated and is now moving with strength. Although the health care index is strong, it had under-performed the S&P 500 in October and has made a spectacular come back... maybe coming too far, too fast. 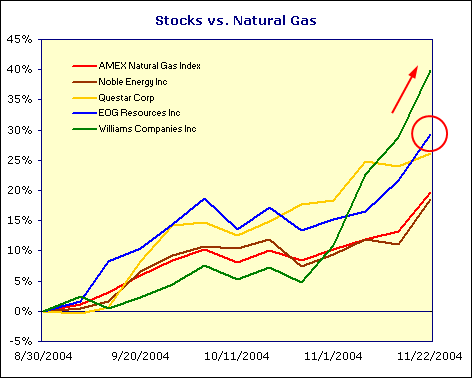 Next, I looked at the components of the AMEX Natural Gas index. It consists of a relatively small basket of stocks -- 15 in all. Williams Companies Inc is very strong... but, it had under-performed its sector for more then half the quarterly period. Questar Corp looks good, as well. Let's go with EOG Resources Inc (EOG) since it has already had a favorable consolidation period from October through November. EOG is in the middle of a third wave up... on, at least, three levels! We should look for the price to find support at the bottom of the up-trending channel before continuing to a price objective of $83. 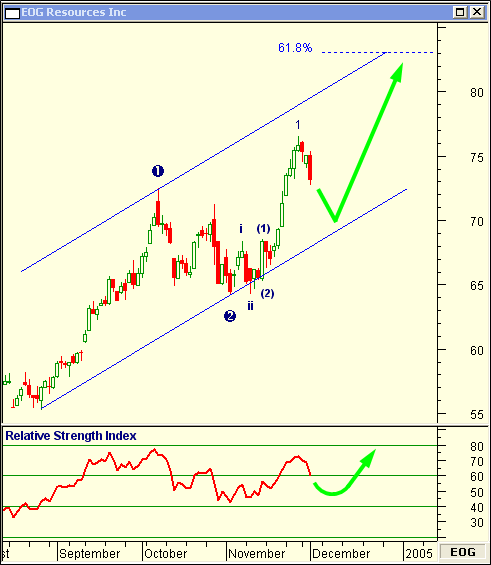 I calculated the price target on the largest wave count which began at the low in August. I multiplied the length of Wave by 61.8 percent and added it to itself. Also, we should watch for the relative strength index to find support at or near 40. When it gets near this objective, we should confirm it with a candlestick reversal pattern. Remember, use multiple, non-correlated technical indicators when analyzing your charts. Doing so will give you the edge needed to make profitable trading decisions.